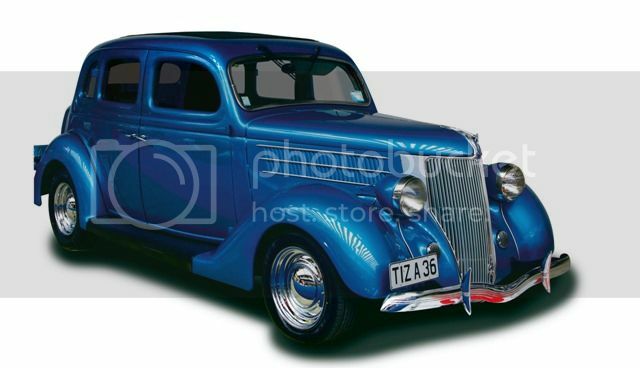 The NZHRA have listened to the overwhelming call for a family car this time around, and have responded with the purchase of a beautiful 1936 Ford Sedan, with some real history. Owned by Wayne Gardiner for around 35 years, this car gave him a lot of enjoyment over the years, and when he was diagnosed with terminal cancer in 2011, his fellow members at Golden Bay Rodders pulled together to get it back on the road. Wayne had the pleasure of driving the car for about 8 months, before passing on and leaving the car to his daughters. Having been in storage for 3 years, the car is responding beautifully to some TLC, with the NZHRA Executive Committee pooling their resources to ensure the car is in top notch condition, as we prepare for lottery ticket sales to start in the new year. 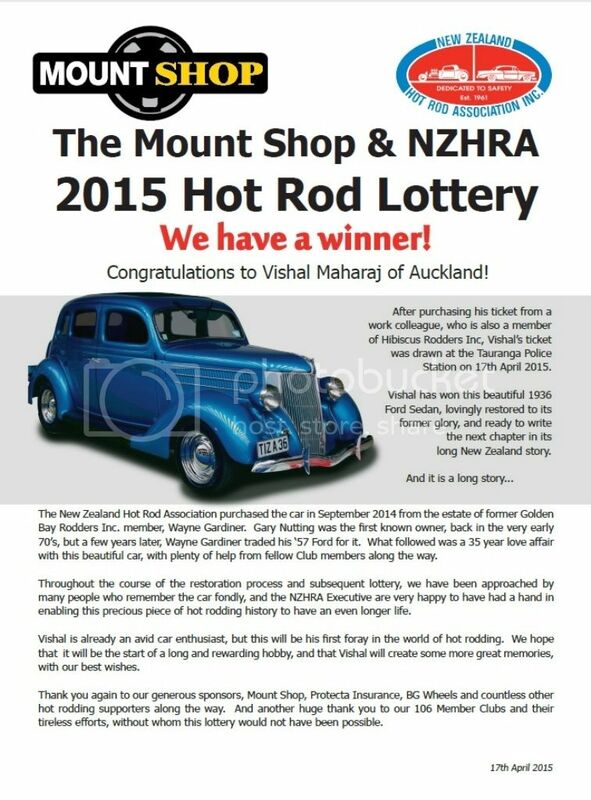 The NZHRA will be very pleased to unveil the finished vehicle at the Kumeu Classic Car and Hot Rod Festival on 17th January 2015, when ticket sales will start. The car will also be in attendance at Hibiscus Rodders' Beach Festival in Orewa on 23rd-25th January, at Leadfoot Festival in Hahei on 6th-8th February, and The Beach Hop in Whangamata in the last week of March. Clubs nationwide will have tickets for sale during this time, as will the NZHRA office via their website, so there will be every opportunity to be in to win. In the meantime, progress of the car can be tracked on the NZHRA's facebook page, as it makes its way up the country. This Lottery is only made possible with the generous support of our wonderful sponsors, Mount Shop, Protecta Insurance, and BG Marketing. We encourage our members to support our supporters. We've had the pleasure of this car popoing up around the South Is in the past Month. Credit must also be given to the NZHRA Exec members who have already put time and effort into this project for us. Good choice of car and going by the interest tickets should sell easily when they come available in the new year. Out of the 15 books I ordered for the club, only got 2 left ! Dished them out at last night's meeting and members came got more today. Would be very surprised if this one doesn't sell out quickly At this rate I may have to order more . The 17th April arrived, and the morning dragged, very slowly, towards 11am - lottery draw time. Mark Joblin, Zone 3 Director, and Alicia Karena, NZHRA Office Manager, transported the precious cargo to the Tauranga cop shop - a container filled with completed lottery ticket butts. Thank you to everyone who made this lottery possible. Every Club Member who sold tickets at work or at events, all of our generous sponsors, and everyone who helped get the car into top condition. We think that hot rodding has benefited from all of the publicity, and we have made one young guy very happy.